/ Slogging Through Data? You’re Not Alone. New technology often gets stuck in “implementation limbo”—despite consensus on its utility, nobody quite knows how to proceed. It’s a growing pain we saw with the advent of the Internet, and we’re seeing it again with data. Recognizing the importance of data is different from fully embracing it. According to a recent Capgemini report, although 60 percent of executives believe big data will upend their industries in three years, only 13 percent of organizations have reached full-scale production of their data initiatives. 79 percent of organizations haven’t integrated their data sources across the organization. This means decision-makers lack a unified view of data, which prevents them from making accurate decisions. With data spread out in different directions across various teams, it’s hard to get a single version of the truth—which is exactly what data initiatives should fix. Unfortunately, you won’t find solutions if you can’t identify problems. Data initiatives cut across many different departments, which makes it difficult to define implementation goals and deadlines. 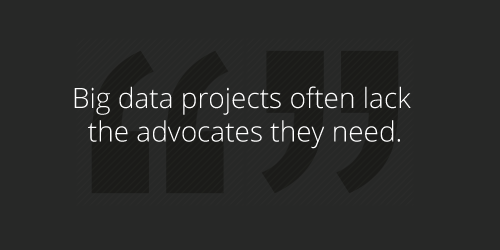 Put simply, big data projects often lack the advocates they need. Without a data-driven culture, rank-and-file members of a company have a hard time seeing how these platforms will transform the way they work. Without those advocates, who approaches the finance team to make a case for funding? And who creates benchmarks for success and oversees the rollout? Nobody. Most of these problems are solved if an executive spearheads the initiative, but even then, numerous people need to be brought into the process. With separate teams in separate departments working on the same project, communication problems are almost inevitable. Given all this, it’s best to have a central team working as a competence center for data, and it’s even better if that team is a distinct profit-making division of the company. Nordstrom, for instance, has set up the Nordstrom Data Lab—a multi-disciplinary team of data scientists, mathematicians, statisticians, programmers and business professionals. Teams like this solve the problem of scattered data because they don’t see consolidated data as a luxury—they need it to do their jobs well. When Filippo Passerini took over as CIO of P&G in 2004, he grasped the potential that data had to transform the decision-making process. He changed the name of the IT department to the “Information and Decision Solutions”. P&G has become a global leader in the use of analytics—a testament to the impact of strong leadership and centralization. A data-centric company culture makes everyone an advocate for these types of initiatives. And when that happens, so do solutions.